This is the successor firm of several partnerships since Jens J. Jensen, Sr. began his practice in 1915 in downtown Chicago. Jens J. Jensen, Jr., President, became a partner in 1956 and is CEO. Currently Jarrett J. Jensen, AIA, ALA, NCARB Architect & Planner is currently President of the firm. Jensen & Jensen has been performing professional services continuously since it's inception, producing over 3000 projects in the Metro-Chicago land area alone. 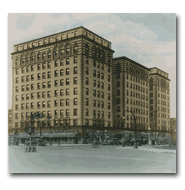 Some early notable buildings include the "300 West Adams Office Building" (1926), and "Gyon Hotel" (4000 West Washington Blvd. at Pulaski, 1927) both landmarks by Jens J. Jensen, Sr. 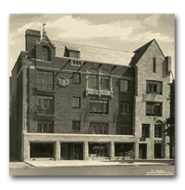 The firm is registered with the Chicago Historical Society. 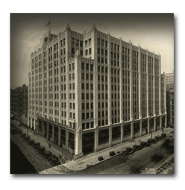 From the 1930's through the 1950's the firm focused on and produced mainly commercial architecture of which office and retail buildings were the majority. Literally hundreds of Grocery, Drug and Shopping Centers & Retail stores were built in and around Chicago by Jensen & Jensen during the last 4 decades, a lasting relationship and track record of which we are very proud. We continue to specialize in commercial and residential Architecture today including store and restaurant buildings, shopping centers, office buildings, and warehouses as well as master planning. Over the last thirty years we have produced a wide variety of projects and building types ranging from small scale residential and institutional, to religious and assembly, to large scale mixed-use and multi-story office and retail projects. Our typical client base consists of a wide variety of local and national restaurant and store chains for private and corporate developers, property owners, and managers. At Jensen & Jensen we enjoy growing with our clients and have done so through a professional commitment to on-time, within budget project completion.